Poverty is an issue which particularly affects children in London. While the child poverty rate has decreased over the past 5 years, it is still similar to the rate in 2015, and remains higher than the overall poverty rate. 37% of London’s children live below the poverty line, which is higher than any other age group. 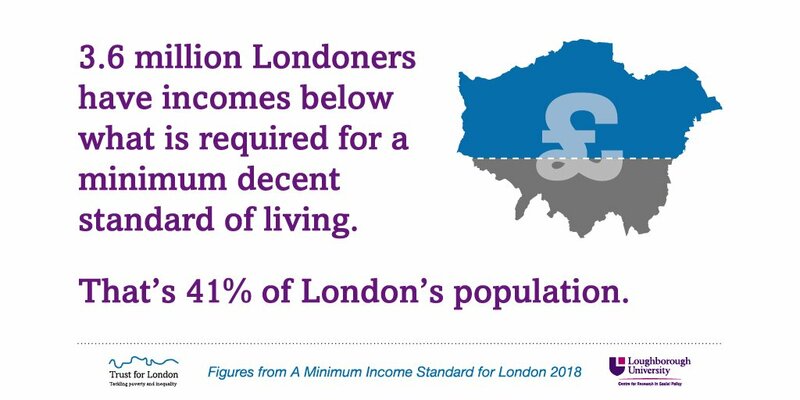 Nearly 5 in 6 homeless households in temporary accommodation contain children, which highlights the impact that the high cost of housing in the capital is having on young Londoners. The unemployment rate for 16-24 year olds is 9%, compared to 4% for 25-64 year olds. More positively, 60% of London’s children achieved 5 A*-C grades at GCSE, compared to 53% in the rest of England. The attainment gap between disadvantaged and non-disadvantaged pupils is also far smaller in London than in the rest of England. We have funded a number of initiatives focussed on children and young people to address some of the particular challenges they face in London and to help ensure that they are able to meet their potential. One example is the Moving On Up Initiative, which aims to improve the employment rate of young black men in London. Another is a secondment we have funded for a member of Coram Children’s Legal Centre to the Greater London Authority’s social integration team. This secondee will work on the Citizenship and Integration Initiative, specifically looking at Young Londoners. We are also members of the London Child Poverty Alliance, which launched a manifesto before the 2018 local elections explaining what Councils and Councillors can do to combat child poverty. We have funded a number of reports about young people’s issues, including work on child trafficking, social integration and the impact of sanctions on young single parents. Some of these reports can be found below and the full range can be found here. To explore more data about children and young people in London, visit London’s Poverty Profile.